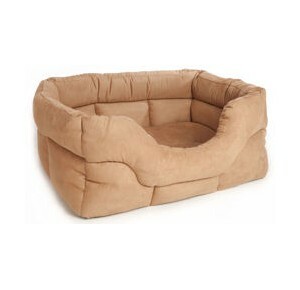 The ultimate in a pet bed, covered in stylish heavy duty & stain resistant furnishings grade Faux Suede Material, Heavy Duty Basket Weave or Faux Leather Material, designed to keep your pet warm & comfortable. The thick base cushion (removable for easy separate washing) is covered with Faux Suede or Basket Weave material one side and Sherpa Fleece on the other. (Faux Leather Both Sides) The high walls of this bed are filled with bonded Thermal Polyester Fibre to insulate your pet from the cold floor and keep it out of draughts. Designed and Manufactured to be fully machine washable keeping shape after washing.